Well over here we are fairly close to the pacific ocean and try and take advantage of the bounty that is the Oregon coast. For my self growing up on the coast, the ocean has a special place in my heart. In my younger days, I have spent may hours hiking high cliff trails around Sunset Bay or camping out on Light House beach. As a small child my next door neighbor was a commercial fisherman and always had a surplus of fish and crab to share. At a young age I must have devleoped a taste for seafood, at this point in my life I really don’t know how I could go with out it. Naturaly I was at the market a few days ago, and took a look at the sea food case to see if there was anything good there. I have to say the seafood counter is hit and miss a majority of the time but this time there it was, I knew instantly by looking at it, it was fresh Rockfish. Yum, I quickly got in line to purchase a fillet, next I couldn’t wait to get them cooked up. Well if you are looking for Rockfish don’t get discouraged if you don’t see it right away, it can go under many different names like, cod, black cod, black fish, ling cod, or snapper. Over hear it is commonly referred to as Rockfish because of were it lives, yep in the rocks. That being said this recipe is delicious with any firm fresh white fish. 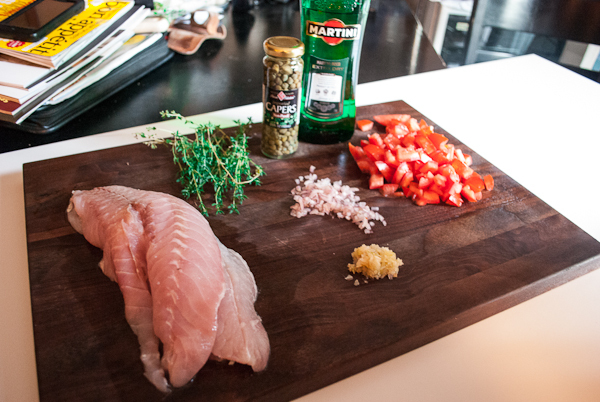 Well here is my take on one way to prepare this awesome fish. Into two non-stick saute pans over medium high heat, divide butter evenly and place into hot pans. 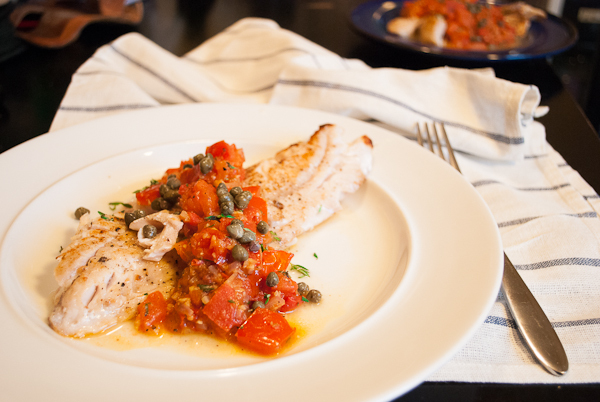 Season fillets on both side with salt and pepper and place into pan then put tomatoes, garlic, capers and onion in second pan. After 3-5 minutes turn fillets over, in second pan add wine and stir and add thyme. In second pan squeeze lemon juice over tomato mixture and stir. Spoon tomato mixture over fillets and enjoy!! !